Feel free to contact us at anytime for questions about our services! Contact us with questions or concerns about our cleaning services. We delight our customers with a revolutionary cleaning process delivered by trustworthy, friendly professionals. 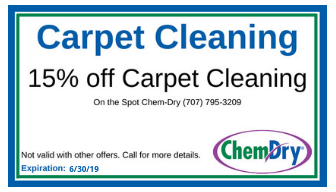 Call today to schedule your appointment and take advantage of On The Spot Chem-Dry’s industry-leading carpet, upholstery, tile, pet urine removal, and area rug cleaning services. We service all of Sonoma County and the surrounding areas including: Santa Rosa, Petaluma, Sonoma, Cotati, Healdsburg, Strathmore, and the surrounding areas. 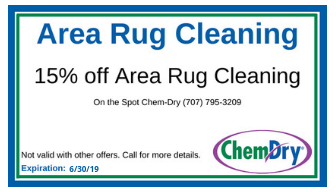 Remember to mention our coupons! Serving all of Sonoma County, including: Santa Rosa, Petaluma, Sonoma, Cotati, Healdsburg, Rohnert Park, and the surrounding areas. 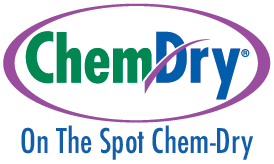 © On The Spot Chem-Dry 2019. Independently owned & operated in Sonoma County, CA /// Site designed by Kite Media.